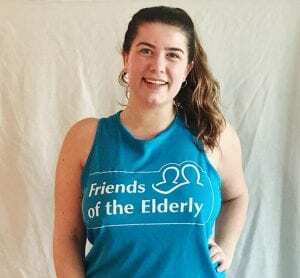 Megan Bradley, aged 22, from Malvern has been selected to represent Friends of the Elderly at the 2018 London Marathon. Since the age of 16, Megan has been volunteering for Friends of the Elderly at our day care services in Malvern and Kidderminster run by our sister organisation, Triangle Community Services. Between now and the 22 April, Megan will be tirelessly training around Malvern and Manchester, where she is studying International Fashion Promotion at university. Megan has also long been singing and performing with her guitar, and will be using these talents to host charity gigs in Malvern and Manchester in the coming months. She also plans to organise cake sales, clothes swaps and book sales. Follow Megan’s training progress and find out about her fundraising events by following her on Twitter and Instagram @marathonmegfote or through her Virgin Money Giving fundraising page here. If you have your own place in the 2018 London marathon, or any other event, and would like to fundraise for Friends of the Elderly we would love to hear from you. Find out more here.